Have you ever wondered about all the different oils available now? Using flavored and specialty oils are a way to add depth and dimension to your cooking without a lot of fuss. Some of flavored oils on the market are infused olive oils, so these can be used in place of plain olive oil. The flavor is very light, not overpowering. 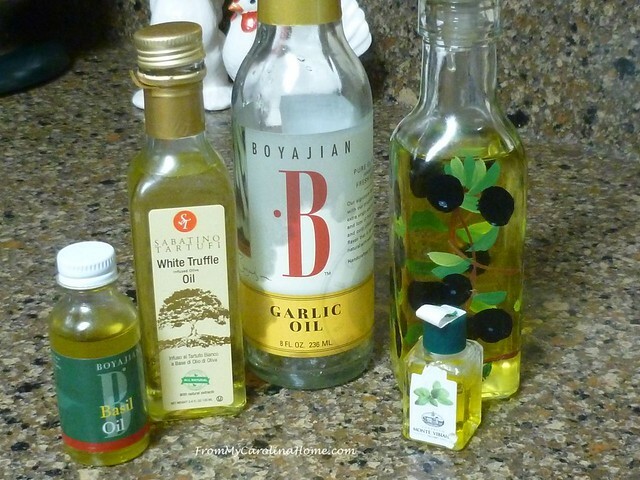 I use enough garlic infused oil that I have a special cruet for it, with olives on painted on the sides. All of these were gifts from my dear husband, who likes to indulge me in the kitchen probably because he gets to eat the results. A long time ago, I made a rosemary infused oil at home, I don’t know why I haven’t done that in a while. First, any of the infused cooking oils or finishing oils can be used in salad dressing. Adding a basil or truffle oil to a balsamic vinegar makes a flavor boosted dressing that will earn you praises, as everyone tries to figure out why your dressing is so much more delicious. 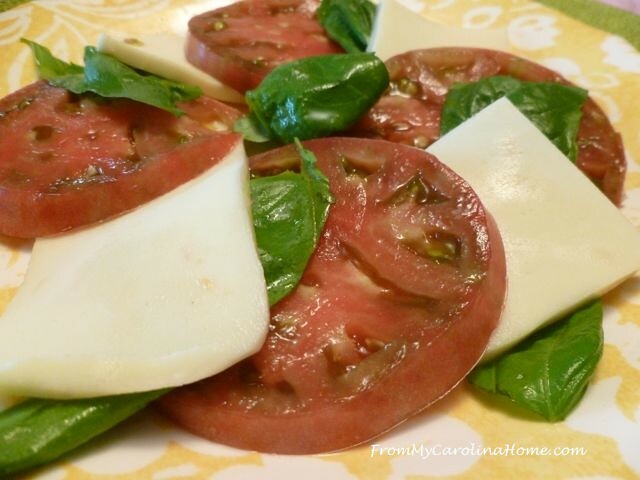 Basil oil is a natural fit as a drizzle on a Caprese salad. 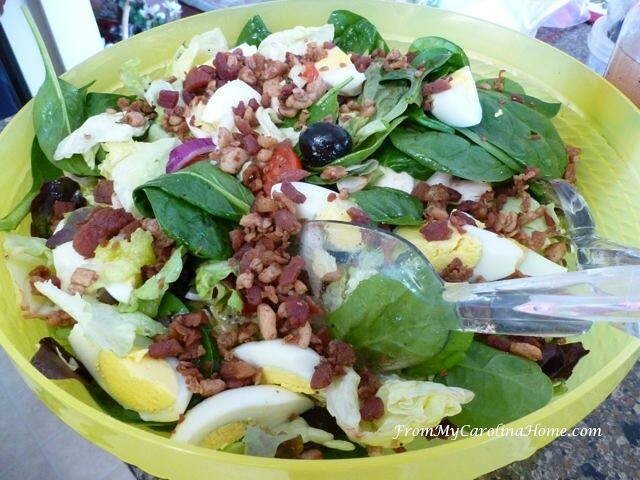 You can even think about adding a bit of truffle oil or toasted sesame oil to egg salad. 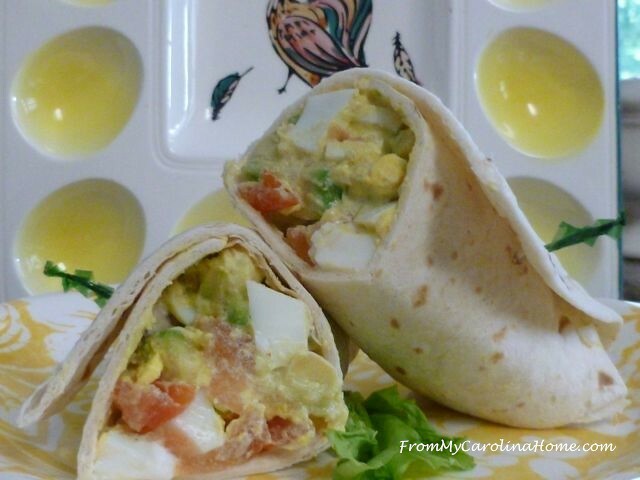 This is my Chipotle Avocado Egg Salad Wrap recipe. 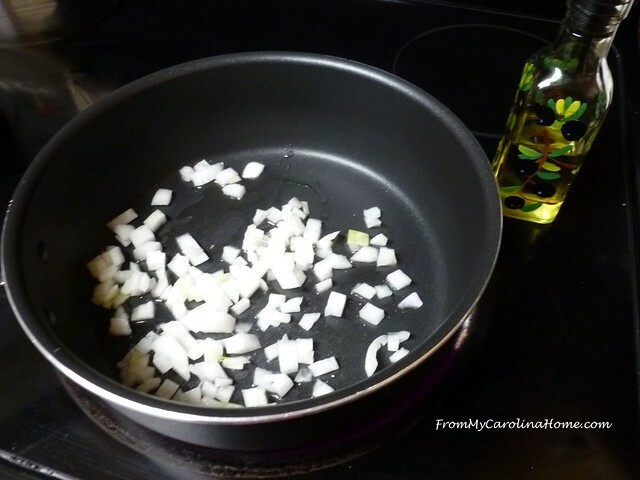 I often use garlic infused oil instead of plain olive oil to saute onions to begin a dish. 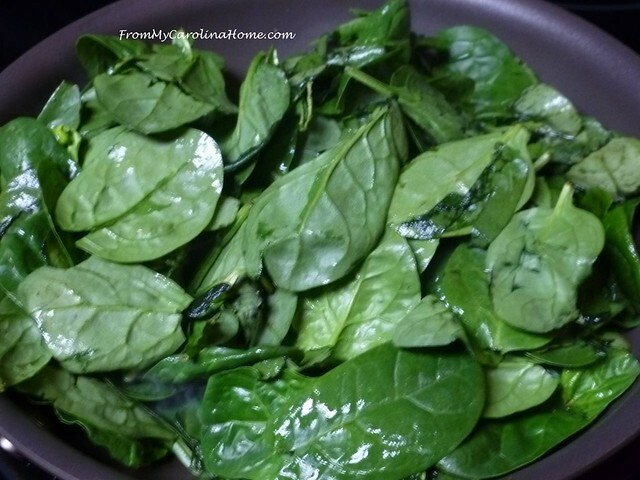 In this meal, I add fresh spinach on top of the translucent onions, cover and cook for a few minutes until the spinach wilts. 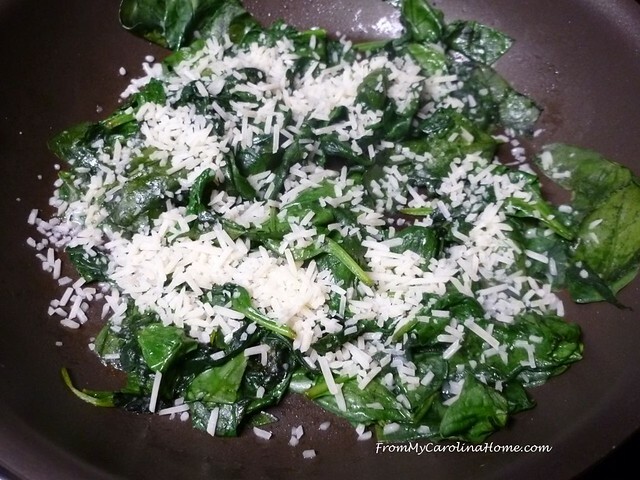 Top with grated Parmesan cheese and serve. This is a really fast side dish. 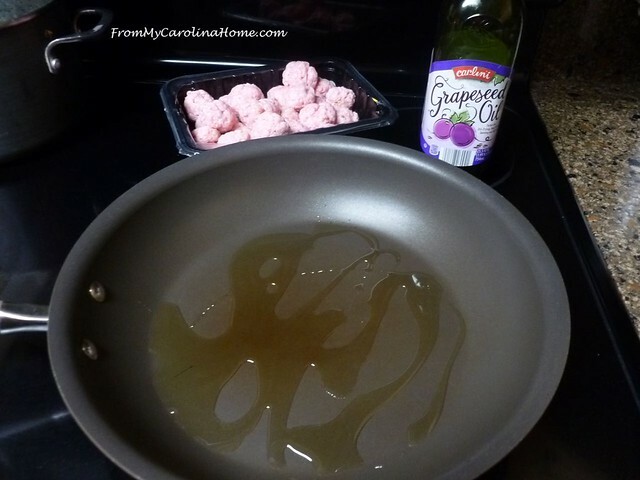 I discovered grapeseed oil recently, and love it for sauteing when I don’t want to add any additional flavor to a dish. It has a high smoke point which makes it wonderful for high heat sauteing or stir frying. 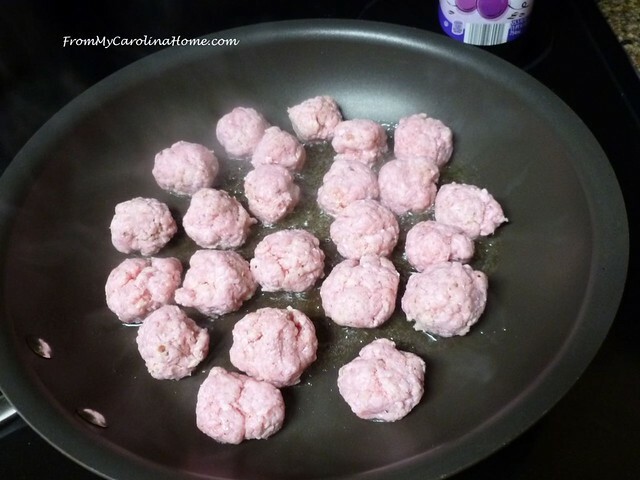 This time, I made veal meatballs, where even extra virgin olive oil would change the flavor of the delicate veal. Grapeseed is a ‘neutral’ oil, meaning that it doesn’t add any flavor of its own, allowing the natural flavor of the food to be appreciated. Using just a drizzle on the bottom of the pan, brown the meatballs. Then remove them from the pan and make a roux with the pan juices and flour. Cook the flour for a minute or two, then add milk to make the gravy. 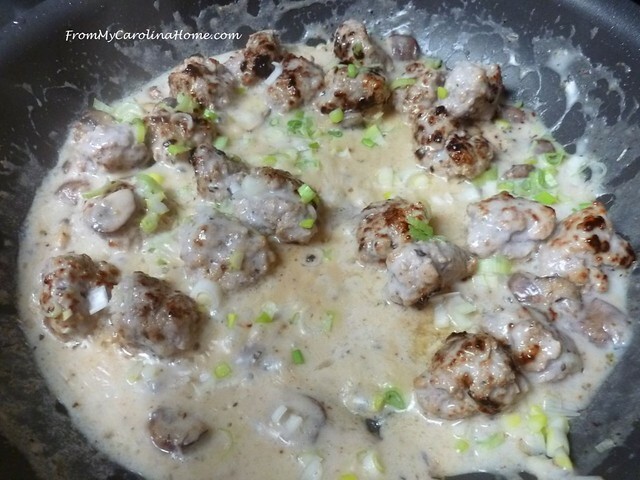 Mushrooms can be added, then place the meatballs in the gravy, and top off with some chopped green onions. I served this with rice, and it would also be good with wide egg noodles. 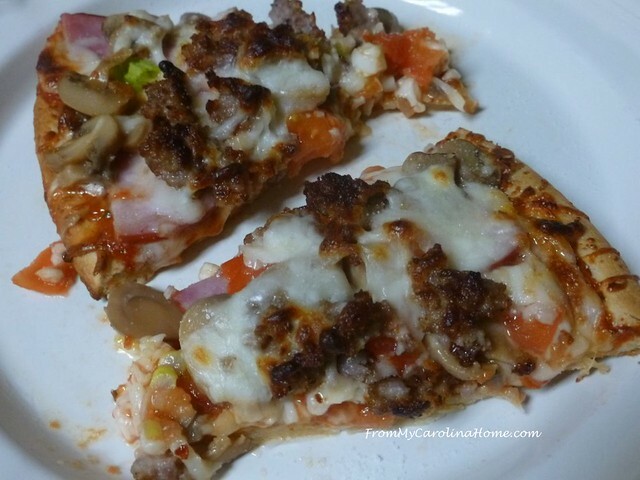 Ever make your own pizza at home? 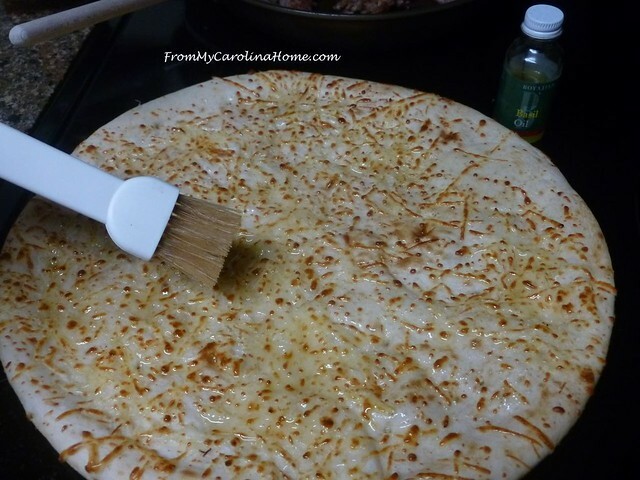 Try brushing the crust with basil oil. This time I used a fully prepared crust, lightly brushing the top with basil oil. Then add the toppings you like. 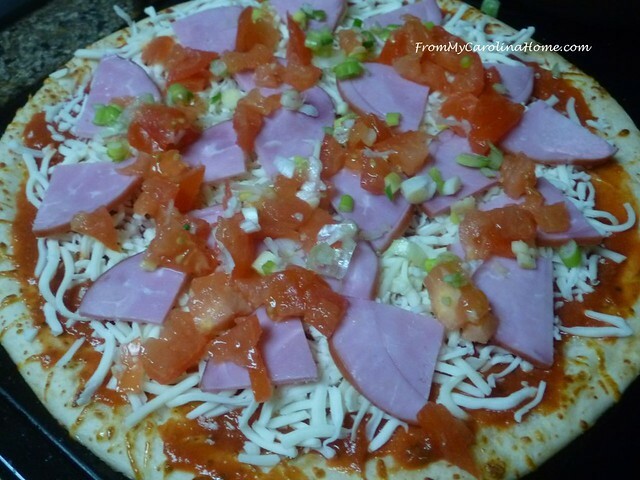 This pizza had Canadian bacon and fresh tomatoes with green onions. I added sausage, mushrooms and double mozzarella then baked as usul. Yum! 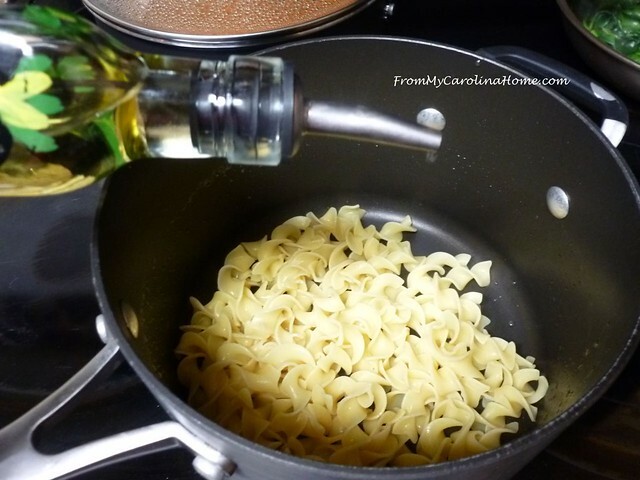 Garlic oil is what I reach for with pasta most of the time. Putting a small drizzle on cooked pasta keeps it from sticking together and adds just a hint of garlic flavor. If you like baked potatoes, try this method. 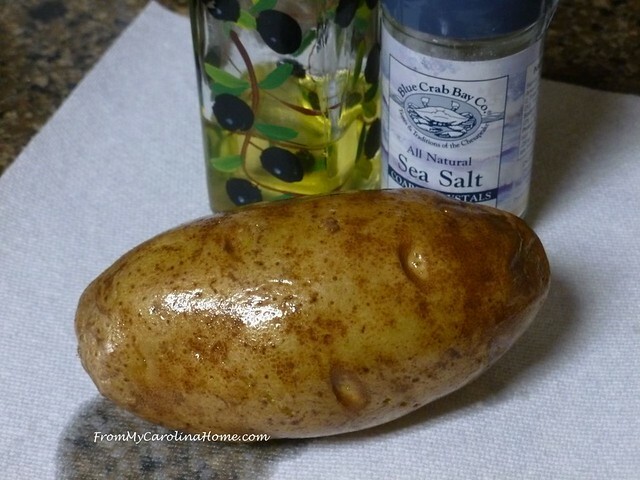 Scrub clean and dry the potato, then rub garlic oil into the skin. Roll it in sea salt. 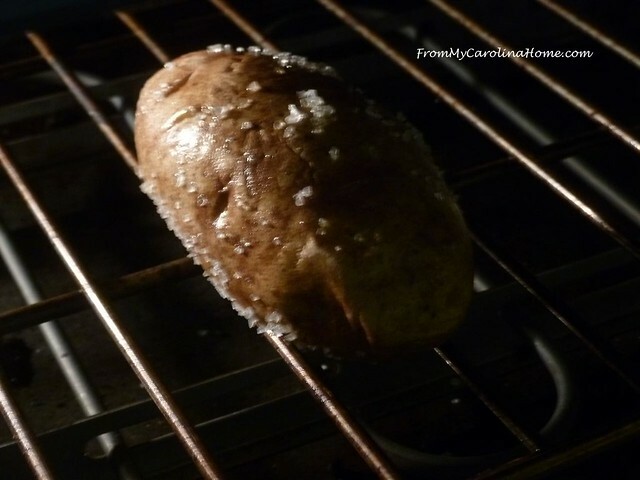 Bake on a rack in the oven, not a pan, so the heat can reach all around the potato. You’ll get a marvelous crackly potato skin, that I like even better than the inside. Another favorite place to use garlic oil is on the grill. 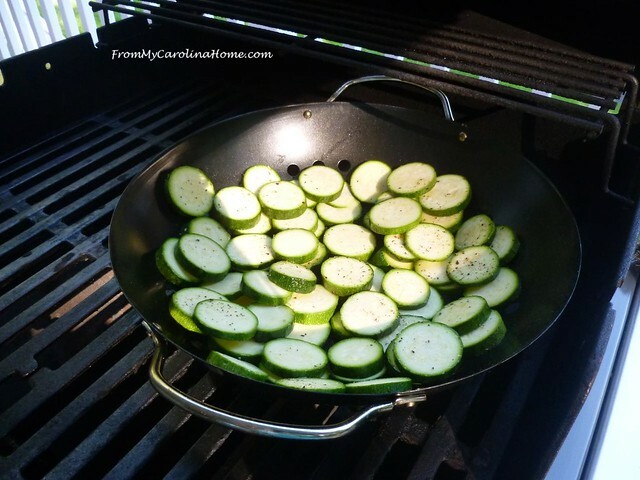 When I grill veggies particularly, I’ll toss them with just a bit of oil before putting them on the grill. Using a grill basket helps keep them from falling through the grill grates. 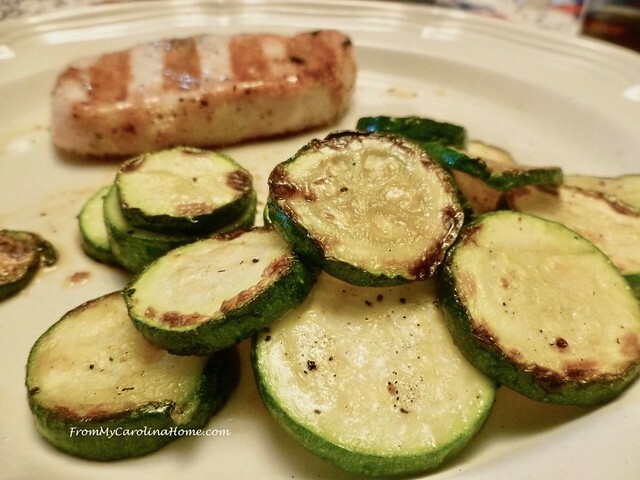 Yum, smoky grilled zucchini, with just a hint of garlic. 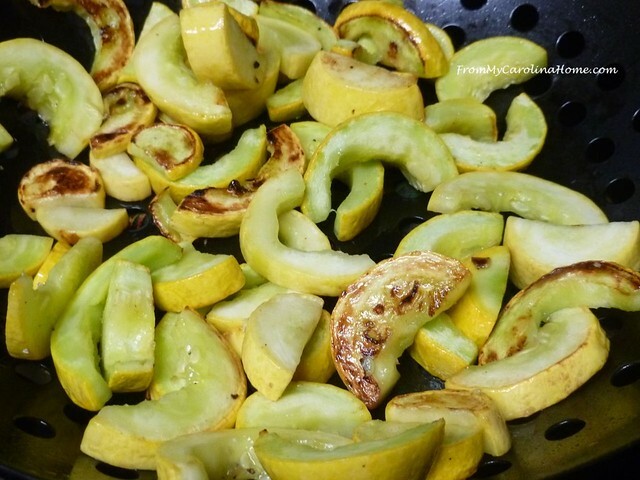 Yellow squash works well too. 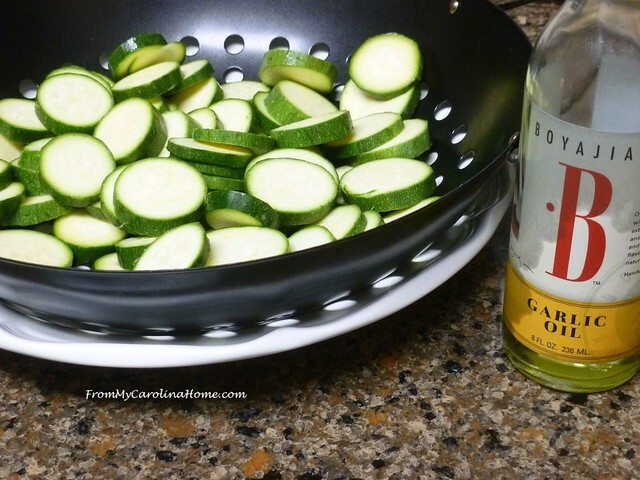 Really any veggie you can grill works nicely with this oil. White truffle oil is a ‘finishing’ oil, meant to be used as a garnish to foods, not to cook with. Just a few drops or a light drizzle enhances the flavor of anything that would taste good with mushrooms. 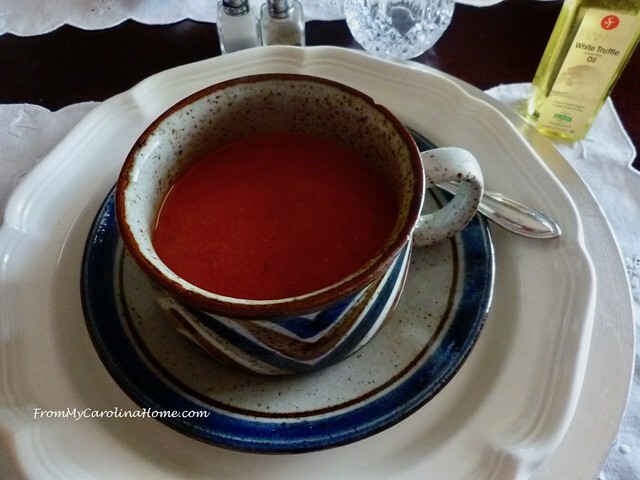 I like to add a bit to risotto, and a few drops in tomato soup will give the dish more depth. 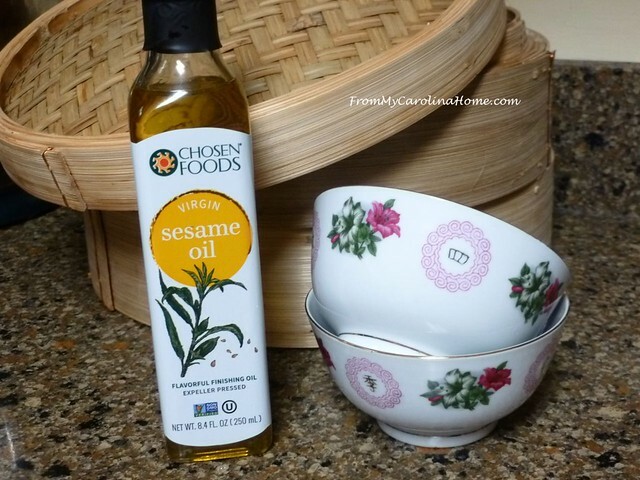 Toasted Sesame Oil is a finishing oil often used in Asian cooking. It has a low smoke point and isn’t good for cooking as it burns quickly. A drizzle added to my Pearl Balls would add a rich umami flavor. It would also be good on my Shumai, seen here in the upper red dish next to the broccoli. 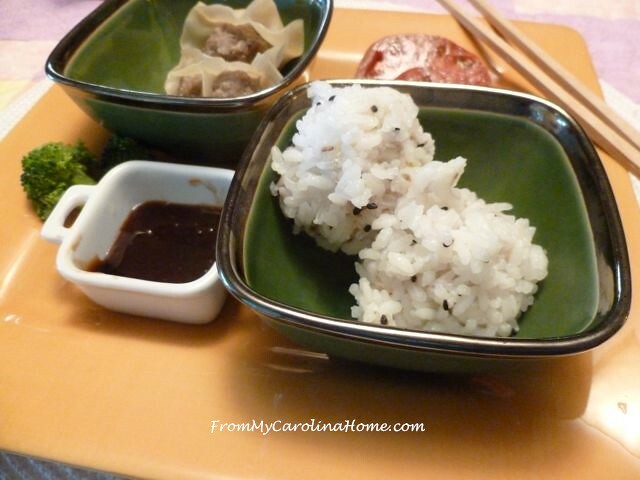 Add a bit to your soy sauce to deepen the flavor. So those are just a few of my ideas on using flavored oils. Have you ever used flavored oils? Do you have a tip to share on using them? 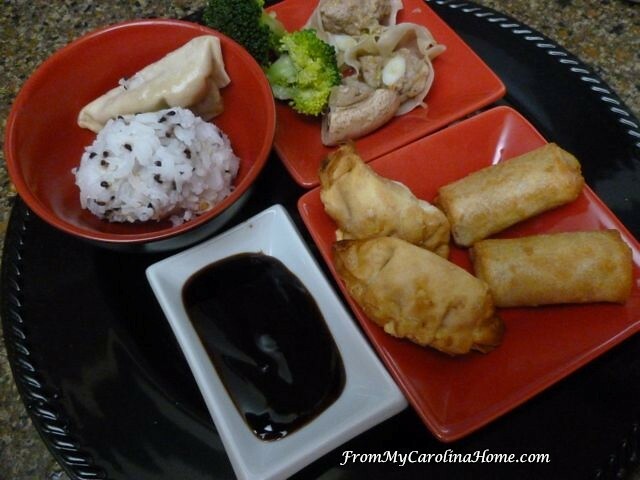 Good suggestions…..I’m already hungry after reading your post. 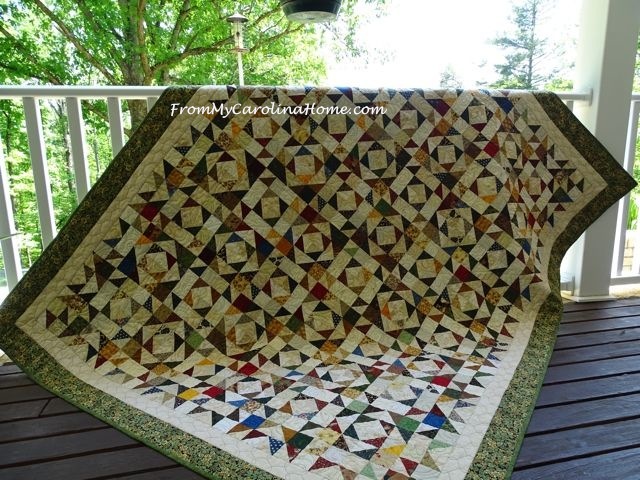 Your competition egg salad recipe looks delicious….I need a change of pace….I’ve been on a chutney egg salad kick for far too long!! Carole, I love using flavored oils. Infused olive oils and white truffle oil are used often to add a lovely finish to pasta and risotto! Thanks for a beautiful feast for my eyes! Yummy! 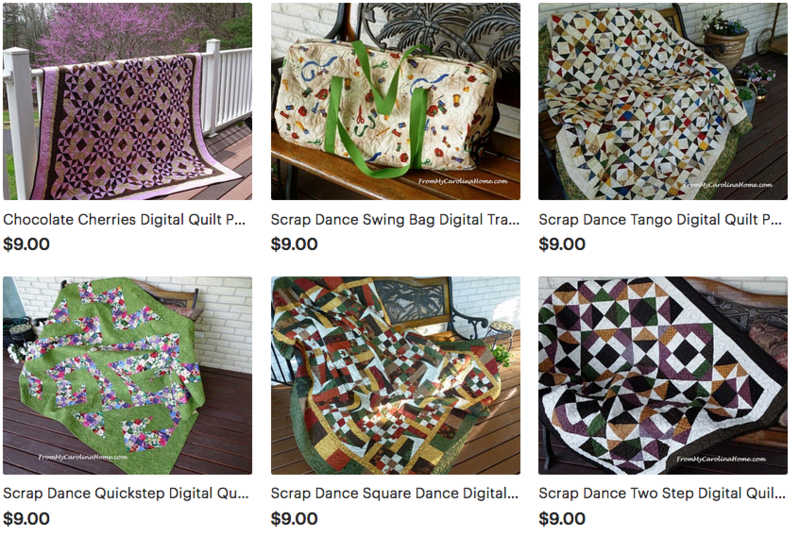 Those are great ideas, and remind me to try my hand at making some of these! Loved this post. I’m not very adventurous in the kitchen, but you have peaked my interest. I need to try some of these oils. 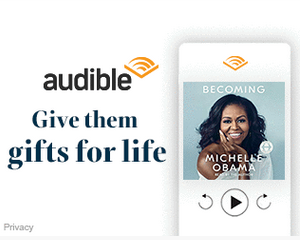 They sound delish! Thank you! loved reading though this post, I am not a great cook but a plain cook. I have a very fussy husband who does not like a wide variety of food which makes it very hard to cook and because of it I guess I really lost interest in it over the years. How long do these oils last – do you just keep them in the cupboard or do they need to be refrigerated? All this information is great! Thanks! I do love using olive, garlic, and sesame oil. I’ve never tried basil or truffle oil and will have to find some of those. I will be putting a Star on this post to save for the summer and making flavored Oils, with my own herbs etc. 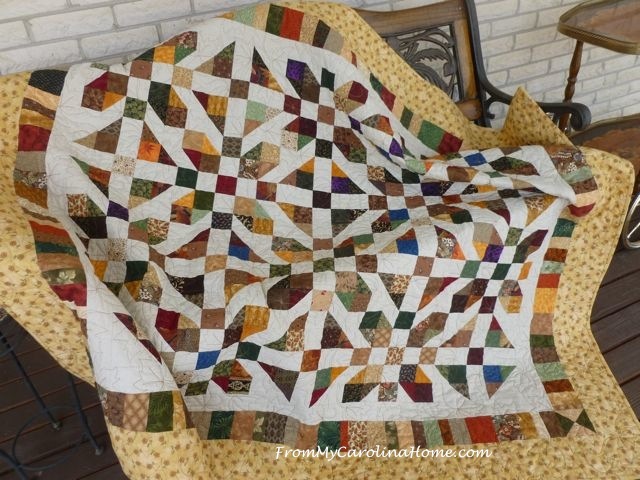 Thanks again for your wonderful blog. Good suggestions for using flavoured oils. I will try some of these. Thanks for all the great information! I’ve never used any of the specialty oils you wrote about, but I think we would really like the garlic oil especially. Loved reading about all those oils and how to use them. I am ready to experiment and try something new. Hello Carole, I thoroughly enjoyed “tasting” all of your delicious oil recipes today and the ways to add them or use them. I can understand why your husband buys you these fantastic gifts for the kitchen! I believe that later on, I will be taking my notebook and pen and jotting down all of these tips and uses for the oils that I know we have not used but gladly will! 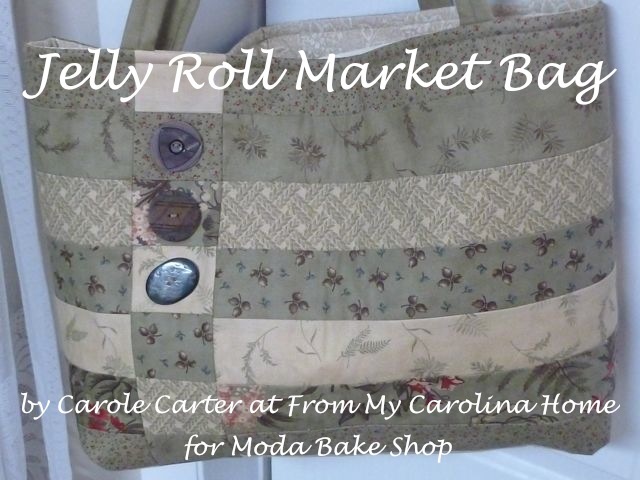 Thank you for sharing your wonderful skills and knowledge in the art of cooking, Carole. Have a wonderful day creating! I adore flavored oils too. You have shown some I am not too familiar with. I have lemon and garlic oil at home now, but my absolute favorite is Rosemary oil, which I cannot find in years! I wonder who carries it. I had a great recipe in the crock pot for a beef roast with rosemary oil, rosemary and balsamic vinegar. I would love to make it again sometime. Thanks for sharing! Well now that I am totally starving for all of these great foods 🙂 I do love using and making flavored oils. I grow my own herbs and garlic and always have way more than I’ll ever use so I make a lot of flavored oils and then use them as gifts and for my own use. I enjoy using flavoured oils and two of my favourites are also by Boyajian – their Orange and Lemon oils. Not orange or lemon flavoured but pure oils from Californian fruit. Absolutely stupendous in baking and savoury cooking. Just half a teaspoon of Lemon Oil in a lemon Drizzle Cake turns into the lemoniest thing ever! I’ve never managed to find them in supemarkets or even specialist grocery stores when visiting the US but like you have to rely on Amazon. 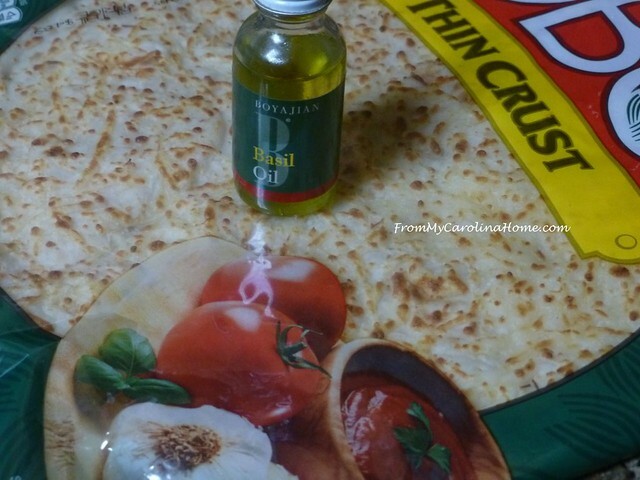 Have you tried Walnut Oil in salad dressings? Or Avocado Oil – that’s good too. 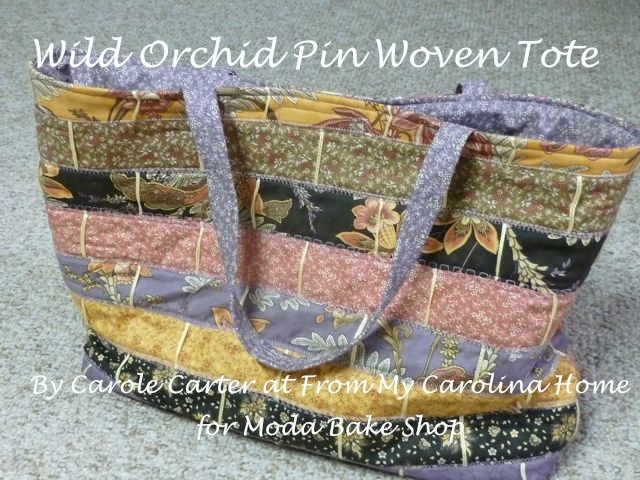 These are great tips, Carole! I have some flavored oils, and for some reason I haven’t used them in a while – thanks for the reminder! Truffle oil is heavenly….I also have truffle salt, which is wonderful to sprinkle on top fo creamy mashed potatoes, or an omelet. I use walnut oil to make an omelet using 1/4 cup cooked swiss chard which I grow in my garden, and 1 whole egg and 1 egg white. 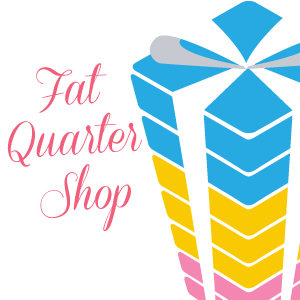 It is every high in omega three fats, which is so good for us. Good morning Carole,Well, we are suppose to have 6-8 in. of rain for the next 5-6 days, guess what I’m going to b e doing—wirking on some unfinished projects while I wait to get some work done on my sewing machine.I’m sorry that my message is a bit confusing , my cat knocked over my drink onto my keyboard and although I have cleaned the keys they still need some more cleaning. There is a shop here about 1 hours drive from me that I have been wanting to go to and check ou, it is an infused vinegar shop and I’m sure that they will have some oils as well, I plan to copy some of your ideas when I get some more black ink, love zuchinni, fix it with a little meat and cheese and seasonings, oh so good and easy to make and I can get 2 meals, helps with the budget a lot. Some of your ideas look so inviting I have to try them. Will let you know how they come out.